This is a collection of Quality-of-Life options, aiming to improve the experience by providing features that would be nice to have or building upon existing game options. I’ll add to the collection over time, but if you have suggestions of something that could be useful please feel free to provide them; maybe they’ll give me some more ideas on features that would be useful. As always, credit to Carlzilla for his assistance. This option aims to eliminate the “Create Wrestler” selection menus completely by providing users with a simple UI that allows them to search for an edit (by name or Promotion) and open the edit creation GUI directly. Allow publishers with a large number of creations to easily find their edits, as opposed to scrolling through the in-game list. Allow players (like myself) who create copies of downloaded edits, for the purpose of tweaking to individual preference, to easily manipulate the downloaded copy as opposed to modelling a completely new character. Allow players to easily view a downloaded edit’s information, as opposed to creating a new model just to view information like parameters/skills/logic. This option allows players to select any referee, downloaded or created, and open a copy in the Create Referee menu. There’s no option to unsubscribe the referee, so this will still need to be done manually. This option allows seconds to enter the ring and grapple opponents when a referee has been bumped. The game takes a random number between zero and the RNG Ceiling provided, then checks it against the Second Interference Logic rating of every second in the match. If anyone passes the check, then all wrestlers will be able to enter the ring; this ensures that a wrestler who doesn’t pass is still able to enter the ring and defend his teammates. Alternatively, if no-one passes then the seconds remain outside. Therefore, the Second Interference Logic rating is important in controlling this option. If any second is player controlled, the check is bypassed and the option is triggered. When an injury is set, the game creates a recovery date based on an edit’s part defense and the user input recovery rate (defaults to a wrestler’s hp recovery setting). On game load, any wrestler with a recovery date that’s less than or equal to the current date is automatically removed from the list. Players can manage injuries manually, or allow the game to automatically control the form. When an edit is Criticaled(!) in a match, an injury is calculated based on the move performed & wrestler’s part defense, and the edit is added to the injury form automatically. Also, any injured edit that joins a match and has his damaged part zeroed out will be penalized with a longer recovery date. Injuries are cumulative as well, so if an injured wrestler undergoes a Critical(!) on another part his recovery date will be increased, while maintaining injuries on both parts. The system can seem complicated at first glance, but it should be easier to follow once you’ve played around with it. And if it seems similar to a certain mechanic in a previous GBA game, that’s purely a coincidence. These are basic options that allow you to override the ring, venue and any defaults set-up for the match. This is intended to work with tournaments and leagues, to allow players to change settings such as theme music, referee or ring type instead of being locked into the initial choice. This option allows players to set themes and referees per ring, in order to eliminate the need to search for specific referees and/or music before the start of a match. This option allows players to create multiple reviewers with their own preferred and disliked sets of wrestlers. Depending on the wrestlers taking part in a match, a random reviewer will provide a star rating at the results screen; now you can re-create epic 6 star matches with your very own Dave Meltzer sitting at ringside! Latest version is available. As per usual, back up your saves beforehand and provide any bug reports if necessary. If you over-write an edit and notice that the game doesn’t generate a new menu, then use the “Return to Main Menu” button. if the mod fails to load, delete your RatingsData.dat file. View, I’m sure I have said it before, but your better edit management portion of this mod is an absolute godsend. Great work, so clean, so simple, so helpful! Glad it helps, it’s really made my life easier. Hoping to get that portion upgraded for 2.0 if nothing else, as I’ve found it to be essential and should be useful for all the hard working edit makers. Updated with a few new options; Custom Ring Settings, finishers keeping the opponent down longer and tag matches forcing all participants to use “Low” Spirit recovery. Next feature, a morale system that will affect ukemi & spirit. Also should involve wrestlers “quitting” promotions if their morale becomes too low, allowing users to add another dimension to their match booking. Also, I’ll be extending the Star Rating system to include the ability to create different review configurations. Enhance the ukemi system by providing buffs/nerfs based on a wrestler’s morale level. Provide another element to booking matches, where bookers will need to manager their wrestlers to prevent them from “leaving” the promotion. Provide the framework for a competitive mode (either solo or with others) where promotions compete against one another to obtain the best average rating over a number of matches. 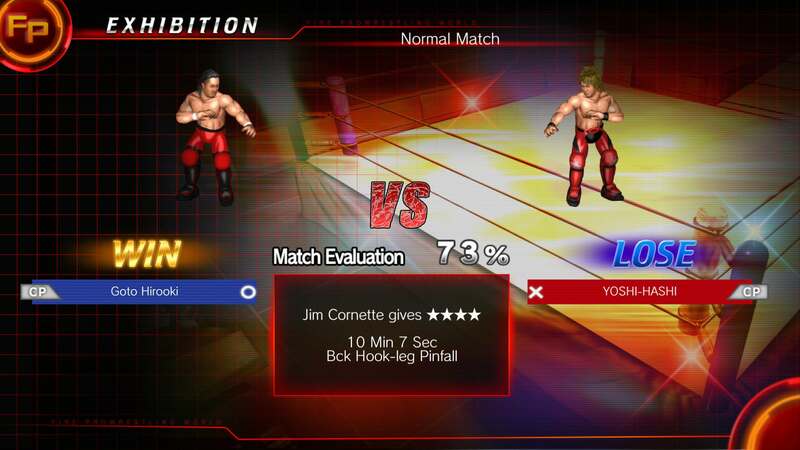 Combined with a number of other mods (Injuries, Carl’s Extra Venue Options, Carl’s Wrestler Heat, Star Ratings, etc) this will be a modular alternative to Final Fire Pro’s MOTR mode. Morale System has been cancelled for the EGO collection. It will be developed within its own, separate mod. Star Ratings now allow players to add multiple reviewers, with their own separate lists of liked & disliked wrestlers. A number of bugs related to Custom Rings have been resolved. New Match actions have been provided; now players can set finishing moves to increase down time, force all edits in a tag match to use low HP/Spirit recovery, and receive an audible cue when a wrestler’s ukemi triggers during a match. Most importantly, it’s now possible to alter a referee’s behavior (based on his Involvement) so that he’ll actively try to get into pinfall position after big moves late in a match; this includes situations where a wrestler hits a big move in the bottom corner of the ring. So, it should now be possible for pinfall victories to occur anywhere within the ring. Entrances are now available in the Dojo and Yurakuen Hall venues, in addition entrance lighting can be added to Yurakuen Hall entrances. So, it should now be possible for pinfalls to occur anywhere within the ring. So it wasn’t possible before? The referee wouldn’t start moving until the pinfall occurred. So, if you pinned far from the referee’s current position it would never end the match. Now, the referee will begin to move after a big move has been performed which should allow him to be nearer to the wrestlers when the fall does occur; I’ve had situations where the referee is directly beside wrestlers at the time of a fall, so he starts counting immediately. I updated the explanation so it’s clearer. Ok that makes a lot more sense. Updated the final version for 1.02, which includes the ability to set Face Lock Overrides per style/edit (includes Irish Whips, Basic Moves and Custom Moves) as well as a number of enhancements to existing features.